Established since 1981, we have offered professional landscape services, coupled with unrivalled customer satisfaction, for 30 years. Our client base is wide and varied, from commercial projects, small and large, to bespoke individual trees and hedges to private gardens, prestigious projects for the UK’s leading Garden Designers, Landscape Architects and Property Developers. We offer a range of products and services. We are one of the UK’s largest suppliers of Semi Mature Trees and the Sole Supplier of the unique ElvedenInstant Hedge . 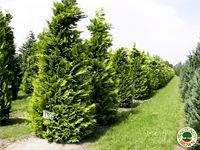 Practicality Brown’s Tree Nursery in Iver is a shop window of Specimen Trees and we are one of the few nurseries who stock containerised Large Trees. Practicality Brown are experts in Tree Moving and is a specialist No Burn Tree Clearance contractor, offering mechanised tree clearance for commercial projects, with the largest fleet of machinery and equipment in the UK. A dedicated department also supplies Bark and Wood Chip products in the South of England. Please choose an item of interest from the menus above and left to discover a little more about how we can help you. If you cannot locate your answer, feel free to contact us.